Mild to moderate strombolian explosions continue, the volcano being at average levels of activity over the past weeks. The intense phase of activity lasted until the next morning (11 Dec) when it gradually decreased and returned to the normal mode of intermittent explosions. Explosive activity has decreased a bit and is now at average levels. The observatory reported 28 explosions of small to medium size during 24 hours (compared to 6-8 per hour at the end of Nov), and ash plumes rising up to 1000 m above the crater. Yesterday, the observatory reported 11 weak explosions (ash plumes rising up to 500 m) and 13 moderate ones (ash plumes up to 800 m). The plumes drifted SE and W for approx. 10 km before dissipating. Light ash fall occurred in downwind areas. Stronger explosions are accompanied by shock waves that can be felt in nearby villages. Light ashfall occurrs from time to time in areas up to 12 km downwind. Yesterday, the volcano observatory reported 16 weak and 14 moderate explosions with ash plumes rising up to 800 m above the crater, that drifted 10-12 km to the west. Incandescent material was seen ejected to 100-150 m above the crater. The volcano observatory reported that explosions with ash plumes of up to 800 m height occurred at rates of 3-4 per hour and produced a plume drifting for about 12 km W and NW. Ash fell on the villages of Morelia, Santa Sophia and Yepocapa. Strombolian activity continues at the volcano. Incandescent material is being ejected to up to 200 m height and ash plumes rise to up to 800 m. The recent, short-lived lava flow has disappeared. Yesterday's new lava flow was no longer active today. Explosive activity has been weak to moderate today. The new lava flow continues to slowly advance on the upper SE flank and reached a length of 200 m this morning. Strombolian-type eExplosions have been relatively frequent and weak to moderate in size, generating ash plumes up to 800 m tall. Activity has increase since last night. A new lava flow started to issue from the summit vent and traveled onto the SE slope towards the Trinidad canyon. This morning, it had reached a length of 150 m. Explosions have become stronger as well, generating ash plumes of sometimes more than 1000 m in height.  No significant changes in activity have occurred at the volcano recently. It remains characterized by weak to moderate strombolian explosions every 1-2 hours on average, ejecting incandescent material to up to 150 m above the vent and producing ash plumes that rise 300-700 m.